More than a week ago, Huawei has made the MediaPad T2 7.0 available in the Philippines. This time, the company has launched two new versions of its successor, the MediaPad T3 7 and 8. 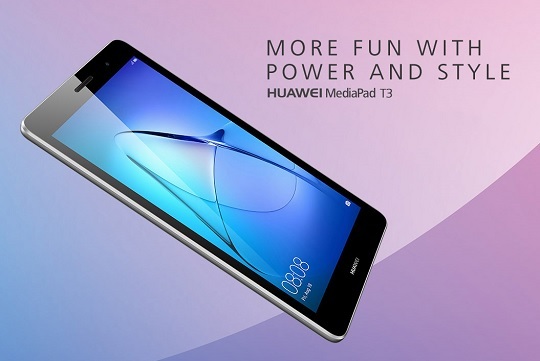 The MediaPad T3 8 has the bigger 8-inch IPS HD display with a 5-megapixel rear camera and 2-megapixel front snapper. Inside, there goes the 1.4GHz Qualcomm Snapdragon MSM8917 quad-core processor with up to 3GB of RAM and 32GB of internal storage. A variant with 2GB/32GB memory configuration is also available. Moreover, it comes with a large 4800mAh battery and runs on Android 7.0 Nougat with EMUI 5.0 on top. What's sad, though, is that it doesn't have a microSD card slot for storage expansion. Meanwhile, the MediaPad T3 7 has a smaller 7-inch IPS HD display with 2-megapixel cameras on both the front and back. At its heart is a 1.3GHz MediaTek MT8127 quad-core chipset with up to 2GB of RAM and 16GB of internal storage. Same with the 8-inch version, the 7-inch one got no microSD card slot and it runs only on Android 6.0 Marshmallow OS with EMUI 4.1 on top. Nevertheless, it comes with a fairly standard 3100mAh battery. There's no word yet on the Huawei MediaPad T3 7 and 8 international availability and pricing.